Have partners or associates in Thailand and need a reliable and convenient method to join together by phone? Try our international conference calling service developed specifically for geographically diverse group calls. Your conferees in Thailand can join the conference call by dialing an in-country Toll Free number at no cost to the caller. As an example, now your client in Thailand can join a conference call with your marketing department located in New York City and your manufacturere located in China, all on the same call. You can use the Thailand International Toll Free access number FROM Thailand or the conference call host can use the dial out feature to bring attendees into your conference call located in Bangkok, Samut Prakan, Mueang Nonthaburi, Udon Thani, Chon Buri, Nakhon Ratchasima, Chiang Mai, Hat Yai, Pak Kret, Si Racha, Phra Pradaeng, Lampang, Khon Kaen and any other city in Thailand. By using our Thailand international conference calling service, you can give each global attendee an access number for their own countries. 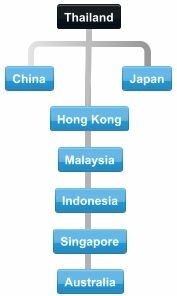 For example, you'd give participants from China a local access number for Japan, Malaysia, or Singapore. The same is true for your participants in USA, Australia, UK, UAE, and other parts of the world. 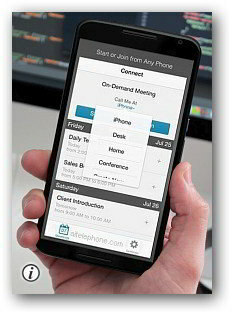 If so, the free included Connect App enables easy connection to the conference call with no access numbers to enter or remember. Our global conference calling service is perfect for frequent and one-time international calls alike. It's a pay-as-you-go conferencing plan with support for more than 150 global network access points and no contracts required. Not only that, there are no activation fees, minimum usage requirements, or monthly fees. Simply host a global audio call and pay for the minutes used at some of the most competitive rates available. Despite a pay-as-you-go pricing model, our global conferencing plan is loaded with free features such as a mobile connect app, live conference viewer, live 24/7 operator assistance, MP3 call recording, auto-generated attendance reports, moderator dial-out, and more. Our global conference bridge leverages a PSTN fiber optic network, ensuring the best sound quality. While our rates may be low, our service is top-tier! According to the CIA World Factbook, Thailand, a country of over 67 million people, had roughly 6.3 million main telephone lines in use as of 2012. In contrast, it had over 84 million mobile-cellular phones in use that same year. In 2009, Thailand had over 17 million Internet users. 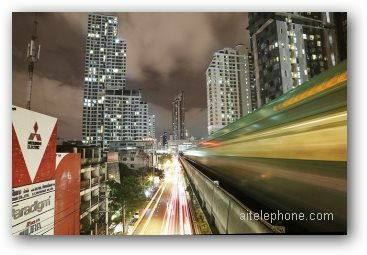 As far as Thailand's phone system goes, it is considered a high quality system particularizing in cities. The majority of the country's fixed line service is provided by a government-owned (TOT Public Company Limited) and commercial service provider (TRUE Corporation Public Company Limited). Thailand's telecommunication system was liberated as of 2006. With over 84 million mobile phones in use, compared to just over 6 million traditional landlines, Thailand's subscribers have increasingly shown a preference for mobile-cellular service which is expanding rapidly. Thailand's move away from landlines and into mobile phones was driven in part by a flurry of competition in the mobile communications space. Price wars resulted in rates as low as 0.25 Baht/minute. Mobile providers in Thailand include: AIS / AIS 3G, DTAC / DTAC Trinet, Truemove / Truemove-H, WEPCT, TOT3G, MY, i-mobile Plus, 365 3G, IEC 3G, Mojo 3G, and i-kook Real 3G. In addition to a move toward mobile-cellular telecommunications in Thailand, VoIP is also popular. Several VoIP service providers provide service in Thailand including CAT2Call, TrueNetTalk, DeeCall, and Mouthmun. 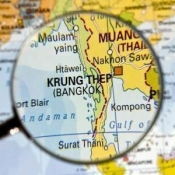 Internationally, Thailand's telecommunication network is connected to Asia, Europe, Australia, the Middle East, the United States, and Europe via major submarine cable systems and two satellite earth stations. Offer international toll free access numbers to your company team members who travel abroad so they can easily connect to your global conference call meetings. Enable geographically diverse international offices to join conference calls to provide input on issues that affect their regions. Antigua, Argentina, Australia, Austria, Bahamas, Bahrain, Barbados, Belarus, Belgium, Bermuda, Brazil, British Virgin Islands, Canada, Chile, China, Colombia, Costa Rica, Cyprus, Czech Republic, Denmark, Dominican Republic, Ecuador, Egypt, El Salvador, Finland, France, Germany, Greece, Hong Kong, Hungary, India, Indonesia, Ireland, Israel, Italy, Jamaica, Japan, Korea, Luxembourg, Malaysia, Mexico, Montserrat, Netherlands, New Zealand, Norway, Panama, Poland, Portugal, Puerto Rico, Russia, Saudi Arabia, Slovakia, Slovenia, Singapore, Somalia, South Africa, Spain, St. Kitts/Nevis, St. Lucia, St. Vincent, Sweden, Switzerland, Taiwan, Tajikistan, Thailand, Trinidad, Tobago, Turkey, UAE, UK, Uruguay, Uzbekistan and Venezuela. The conference call chairperson can optionally use the included dial out feature to bring attendees into your conference call located in Nigeria, Lebanon, Belgium, Guyana, French Polynesia or any other country globally. You may be located in Bangkok or Prakan or any other city in Thailand and join international conference calls from Thailand. Your invitees in Thailand can easily join your international conference call by dialing the Thailand Toll Free access number. You can be located in Thailand and use the service as a participant or the chairperson. To use this service, the Thailand conference call moderator or participant would simply dial the Thailand Toll Free number.